Believers baptism is without question one of the most central articles of faith of the Anabaptist and Mennonite heritage. One portion of the Anabaptist movement began in Zürich in 1525 with a historic act of believers baptism, and the tenet on believers baptism leads the list of seven Schleitheim articles of 1527. 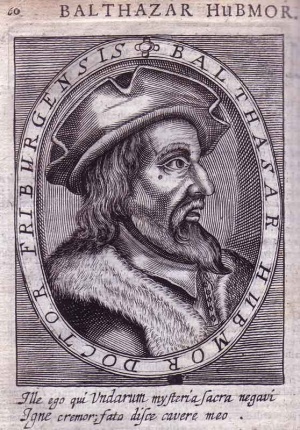 In 1966 there appeared the first book-length study on Anabaptist baptism (Armour), which examines the baptismal theology of Balthasar Hubmaier, Thomas Müntzer, Hans Denck, Hans Hut, Melchior Hoffman, and Pilgram Marpeck. These Anabaptists "differed somewhat in their view of the time and manner of inner transformation," but "they were at one in saying that the only legitimate basis for receiving baptism and entering the baptismal covenant was the experience of regeneration within, a regeneration which gave the believer power to make a valid confession of faith. . . ."
Recent confessions of faith continue to reaffirm the principle of believers baptism. The 1963 Mennonite Church (MC) Confession of Faith says, "In order to qualify for baptism one must repent, turn to Christ in sincere faith, and accept Him as Lord." Similarly, the 1975 Mennonite Brethren Confession of Faith says, "To qualify for baptism, one must repent of sin and trust Jesus Christ as personal Savior and Lord." The Confession of Faith in a Mennonite perspective approved by the Mennonite Church and General Conference Mennonite Church in 1995 says, "We believe that the baptism of believers with water is a sign of their cleansing from sin. Baptism is also a pledge before the church of their covenant with God to walk in the way of Jesus Christ through the power of the Holy Spirit. Believers are baptized into Christ and his body by the Spirit, water, and blood." A study of five Mennonite groups in 1972 found 82 percent of the respondents agreeing that "baptism is neither necessary nor proper for infants and small children." Seventeen percent of the respondents were uncertain or disagreed. A later 1989 study found 84 percent of respondents continued to agree with the statement. The Kauffman/Harder study found the median age of baptism in the Mennonite Church (MC) to be 14 years, in the General Conference Mennonite Church 16.5, in the Mennonite Brethren Church 16.3, and overall 14.9. In the last several decades Mennonite baptismal theology has moved from a restatement of objections to infant baptism to the question of the appropriate age of baptism of children and youth reared within the sphere of the church. It has also addressed the related question of the appropriate kind of religious experience to be expected of those coming to baptism who have been reared within the church. In his 1956 Conrad Grebel Lectures, Gideon Yoder anticipated the later interest in "faith development" by speaking of a "religion of childhood" -- that is, of a pre-adult understanding of faith. Yoder invited respect for such a "religion of childhood" and sought to resist tendencies to impose upon innocent children in the church the radical kind of conversion more usually characteristic of adult sinners. Similarly, J. C. Wenger in Introduction to Theology (1954) wrote "It is cruel and unchristian to attempt to precipitate a conversion experience on those who are not sufficiently mature to experience conversion. Furthermore it is actually impossible to bring an individual to Christ when the Holy Spirit is not working in his heart." James H. Waltner has claimed "it is ... important to distinguish between the religion of childhood ... and a Christian experience which is based on faith and repentance. . . . If we understand salvation as acceptance also of the lordship of Christ to lead us into a life of discipleship, then a child may not be ready for the commitment implied in baptism.... We should be cautious about using baptism as a device to hold the children while they are young so that they don't get away unbaptized when they are older. That kind of baptism has little meaning and may innoculate them against a more meaningful experience later." In Believers Baptism for Children of the Church (1983), Marlin Jeschke called for careful notice of the special situation of children of the church. An unreflective and singleminded fixation upon believers baptism, reinforced by an idealization of the sensational conversions of modern evangelism and missions, is in danger of blinding people to the quite different circumstances of those born and reared within the community of faith. Because children of believers are instructed in Christian homes and within the Christian congregation, their responsibility when they reach the age of discretion is to appropriate and make their own the faith in which they were reared. They should not be expected, as pagan adults would be, to leave a sinful world in which they were reared in order to cross over into the Christian church. Someone privileged to have been reared in a Christian community will not likely have as dramatic a conversion as a notorious sinner. But the experience of one brought up "in the discipline and instruction of the Lord" (Eph. 6:4) such as a Timothy, who from his childhood knew the holy Scriptures, is not to be considered inferior. Indeed, it is "the more excellent way" of coming to faith, the way intended in God's institution of the Christian home and church. Two 1980s books by Maurice Martin offered helpful counsel to a congregation on how to minister to its children in their faith development. A subject that Mennonite baptismal theology had not sufficiently addressed by 1990, likely because of Mennonite suspicion of sacramentalism, is that of the timing of baptism -- connecting the sign with the reality signified. In marriage the timing of a wedding is usually deemed important, because a wedding is not just a sign of marriage but also the rite that effects the marriage. As a sign of faith, is baptism chiefly a report of a past decision of faith or, as in the New Testament, the effectual sign by which someone coming to faith is actually incorporated into the body of Christ? Mennonite baptismal practice has always employed the authoritative classic formula, "I baptize you in the name of the Father and of the Son and of the Holy Spirit," which many take to imply that the act of baptism effects what it signifies (ordinances). The mode of baptism (affusion or immersion) has become a less controversial issue in the 1980s. Affusionist congregations occasionally grant immersion baptism to those desiring it. Some immersionists, including some Mennonite Brethren at least, are accepting by transfer of membership those believers earlier baptized by affusion. A number of Mennonite Church (MC) and General Conference Mennonite Church congregations have begun to accept by transfer of membership believers who were baptized as infants without requiring them to be rebaptized. Armour, Rollin. Anabaptist Baptism. Scottdale, 1966. Jeschke, Marlin. Believers Baptism for Children of the Church. Scottdale, 1983. Kauffman, J. Howard and Leland Harder. Anabaptists Four Centuries Later. Scottdale, 1975. Kauffman, J. Howard and Leo Driedger. The Mennonite Mosaic. Scottdale, 1991. Martin, Maurice. In the Midst of the Congregation. Scottdale, 1983. Miller, Marlin E. "The Mennonites" in Baptism and Church, ed. Merle D. Strege. Grand Rapids: Sagamore Books, 1986. Poettcker, Henry. Baptism in the New Testament. Newton, 1963. Waltner, James H. Baptism and Church Membership. Newton and Scottdale, 1979. Yoder, Gideon. The Nurture and Evangelism of Children. Scottdale, 1959. Jeschke, Marlin. "Baptismal Theology." Global Anabaptist Mennonite Encyclopedia Online. 1989. Web. 21 Apr 2019. http://gameo.org/index.php?title=Baptismal_Theology&oldid=162872. Jeschke, Marlin. (1989). Baptismal Theology. Global Anabaptist Mennonite Encyclopedia Online. Retrieved 21 April 2019, from http://gameo.org/index.php?title=Baptismal_Theology&oldid=162872. Adapted by permission of Herald Press, Harrisonburg, Virginia, from Mennonite Encyclopedia, Vol. 5, pp. 55-56. All rights reserved. This page was last modified on 31 December 2018, at 13:45.